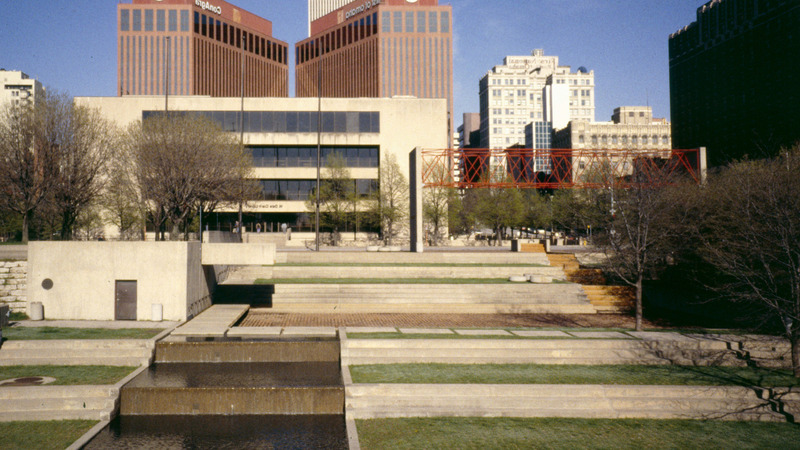 Designed in 1974 by Lawrence Halprin & Associates, with a team led by Don Carter, this 9.6-acre public park was developed as a key component in the revitalization of Omaha’s downtown business district. The rectangular site, formerly a rail yard and lead smelter, is positioned perpendicular to the Missouri River and the Heartland of America and Lewis and Clark Landing parks. 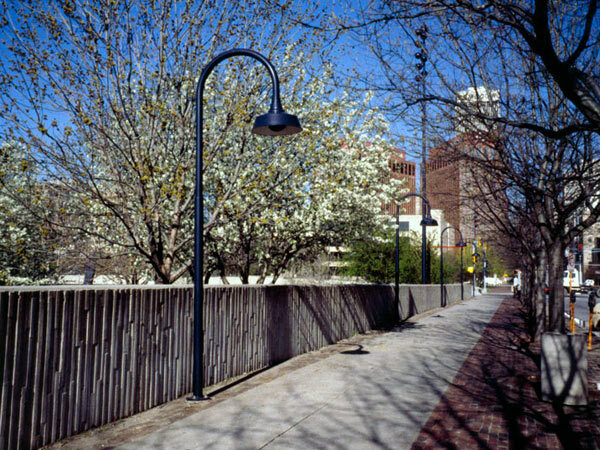 The project incorporates motifs used in Halprin’s earlier work, including the multi-level sections of Lovejoy Plaza in Portland, and the nonlinear spine of Nicollet Mall in Minneapolis. At Central Park, the western entrance to the space steps down from the street level in a series of concrete and grass terraces, leading to a narrow, constructed pond that runs the four-block length of the park. 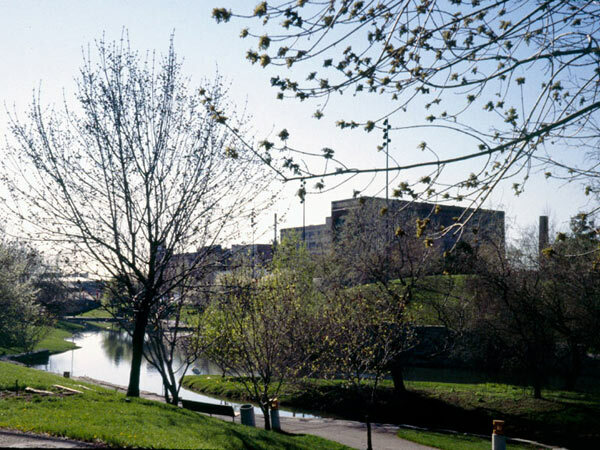 Sloping lawns with informal stands of trees and square rock outcroppings make up the irregular banks of the pond, which makes an attempt to visually reconnect downtown Omaha with the river. 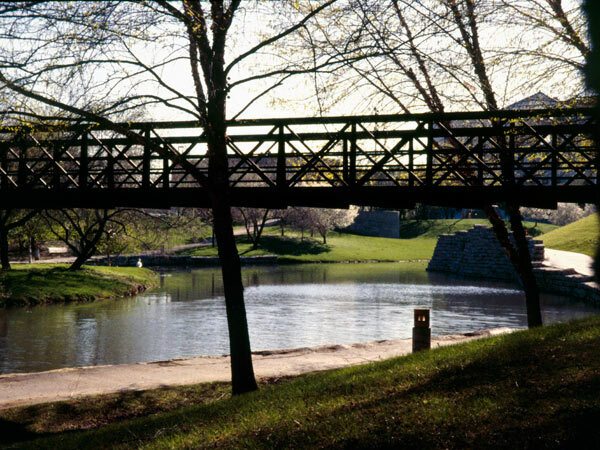 An amoeba-shaped island sits at the midpoint of the river and is linked to the inland park via steel trestle bridges. The outer edges of the park are populated with concrete stairs, slides, and waterfalls; as well as an amphitheater for outdoor concerts. 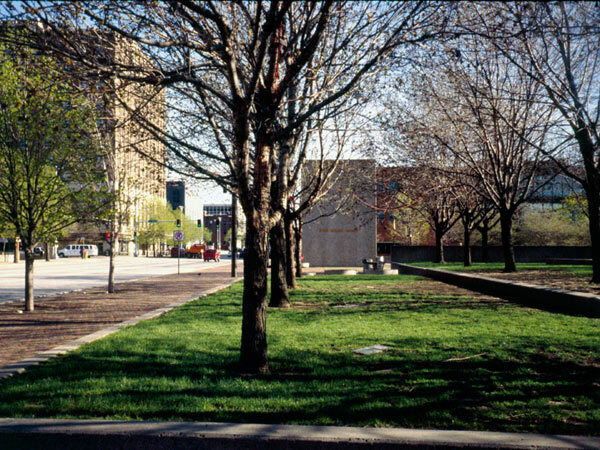 The park was renamed Gene Leahy Mall in 1992, after the former mayor who oversaw its creation. 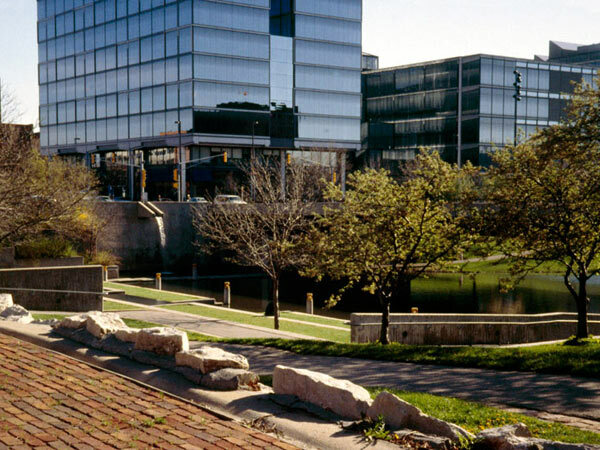 In 2004, after several decades of neglect, the city commissioned Michael Van Valkenburgh Associates to design the rehabilitation plan for the park as part of the capital improvement initiative, Downtown Omaha 2030. The park underwent renovation in 2013.